Thanksgiving is right around the corner, and sometimes even those of us with a die hard Julia Childs streak need a break. After all Mama, you get a delicious and nutritious meal on the table three times a day (that’s over 1000 meals a year, give or take a pizza here and there!). Thanksgiving, that extra special meal with extra extra courses is the perfect time to take the day off. No hot kitchen, no getting up early to chop, stir, season and repeat: there are plenty of spots around town where all you have to do is heat and platter. Now that’s something to be grateful for! Perhaps you love to cook, and have exacting tastes, but the mess and the fuss on Turkey Day are too tiring to contemplate. Dream Dinners has got your number. This ingenious concept allows you to get their kitchen dirty and wait for it: They clean up after you! So throw the spices around, leave the crumbs on the counter, make it just how you like it and celebrate that you are excused from sweeping and sponge duty. For just $48.90, you can get a boneless turkey that feeds 6. All you do is season and package to take home. Need the sides also? How does gorgonzola mashed potatoes, cheesy mashed potatoes or garlic mashed potatoes sound? Stuffing, green bean casserole, and sweet potatoes with maple brown sugar can also be purchased. Oh and don’t forget the cranberry relish, turkey gravy, or the biscuits as you head out the door, arms stuffed with all kinds of goodies. Multiple locations, check the website to find the one nearest you. Pickup is at their location in Compton. Want the whole meal or pieces of the meal? Let’s say you only want the gravy or mashed potatoes. Or maybe four choices that includes the salad, turkey, Brussels sprouts and and dessert? Then check out Ammo, where you can get just what you like. The belief behind Ammo is to cook with the seasons and offer local ingredients. This is a meal that can’t be beat. Last day to order is November 25. Pickup is at their restaurant in Hollywood. A complete holiday dinner is just a stop away in Burbank, no fuss, no thrills, just traditional turkey dinner at a very reasonable price. For $49.99 you will receive a meal that serves 8 to 10 people. Need more? For $79.99 get a meal that serves 14 to 16 people. Need even more? Go for the $99.99 choice that serves 16 to 20 people. Comes with a fully cooked turkey, stuffing, mashed potatoes, gravy, cranberry sauce, and dinner rolls. All you have to do is heat and serve. Pickup is at their restaurant in Brentwood. Start with the braised free-range turkey thighs, or perhaps the beef brisket. Move on to the savory cornbread pudding, the cranberry orange sauce, the green beans with caramelized shallots, and the maple bacon biscuits, and finally order up the gingerbread layer cake with salted caramel frosting. Those are just some of the choices on Huckleberry Cafe’s Thanksgiving take out menu. 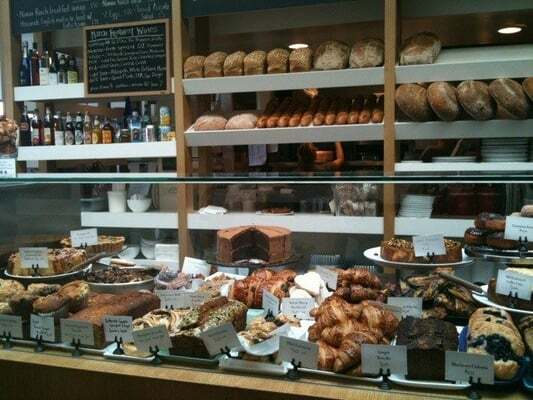 Oh, and throw in some of those amazing breads like the cranberry walnut or brioche. Now roll yourself out the door. Pickup is at their restaurant in Santa Monica. You don’t mind throwing the turkey in the oven, but all those sides? Too much work, too many burners! We’ve got a place where you can order ’em up with an elegant touch. Think yams with maple syrup, raisins, and butter-toasted walnuts; quiche with wild mushrooms and Gruyere; sausage stuffing or a vegetarian option of cornbread stuffing with wild sage, baby artichokes and mushrooms. Yes, those will do perfectly. Order, bring home, heat and serve. Easy, peasy. All orders must be placed before Nov 26. Want to order an entire gourmet meal, so all you have to do is set the table? No worries, Thyme Café and Market is the answer to your prayers. They offer an entire cooked meal that will have foodies screaming for joy. Here are some examples to get those palates watering: mini Gruyere grilled cheese with fig jam, haricot vert with orange zest & hazelnuts, mixed greens with pomegranate seeds, Fuyu persimmons & candied pecans. Orders must be placed no later than November 25 at noon. Sometimes you just want nearby and easy. When that’s married to organic and delicious, all the better. Since there’s a Whole Foods in pretty much every town these days, this option is close by and fully customizable: order your cooked turkey and sides, or just the turkey or just the sides. Can’t get easier than that. Go for the traditional sides: gravy, stuffing, mashed potatoes, and cranberry sauce or for the nontraditional: spinach artichoke dip, petite crab cakes and/or wings. Don’t forget the rolls and bread, dessert and even ice cream, all in one stop. A standout dinner will be had by all with a visit to The Original Farmer’s Market. Your meal will come together in a moment, all from specialty purveyors who really know their stuff. Maybe you would like to cook the entire meal, but are not interested in tackling the turkey? Got you covered. Bring your uncooked turkey, a few days before Thanksgiving, to China Depot and they will oven roast it for you. Call to add your name to the reservation list and for details. Pre-order a 12-14 pound, cooked turkey breast, set the table and eat. Think about it, no bones, no cooking grease, no 5 hour cooking time. The only thing you will have to do is warm it up, slice, and serve. Call to reserve. Bread is one of the essential ingredients for one of the essential parts of the meal: the stuffing. It’s also key for the day after T-day. How can you make a turkey, cranberry, stuffing sandwich without the right bread? T&Y offers fresh baked breads with some unique varieties from Russia, the owner’s native country. Of course you need dessert for your Thanksgiving dinner. And when you can’t decide between pumpkin, apple, blueberry, or lemon meringue, just give in to temptation and order all; you will not be sorry. Baked fresh daily, Du-Par’s usually has so many holiday orders that the pies can reach the ceiling, fun sight for kiddos when you come to pick up your own pie. Order early. Need a special kick to your famous bourbon sweet potatoes? Visit the Buffalo Trace Distillery website to search through their award winning bourbons. Then scoot over to your local liquor shop and pick one up to really up the ante on this years pre-dinner festivities. Thanksgiving is not complete without a cheese tray. Offer your guests a chance to eat and chat while you finish your final prep. (Ok, there is no prep, but they don’t need to know. You can sneak off with a few snacks and a glass of bourbon to enjoy in the kitchen while you sprinkle a little flour on your nose for that “been working over a hot stove all day” look…) Surfas Café provides a cheese, nut, and fruit platter in three sizes. And while you’re there, check out the choices in the freezer section for some stellar ready-to-go gourmet appetizers. Delicious and everyone will think you are a star chef. Don’t worry, we won’t give away your secret. Surfas Café also offers fruit platters and a biscuit tray with four different kinds of biscuits. The Cheddar and Chive is particularly divine. What are some of your family Thanksgiving traditions? Tips about what to order at these joints or know some other great spots, let us know. Photo credits: Steve A Johnson via flickr, Josuab via flickr, ukanda via Creative Commons, Kristie H. via Yelp, Gordon C. via Yelp, Michael Newton via Creative Commons and Buffalo Trace Distillery via facebook.